Thermo-Mix B mixers are devices of various capacity used for therapeutic mud mass preparation which is used in thermotherapy. 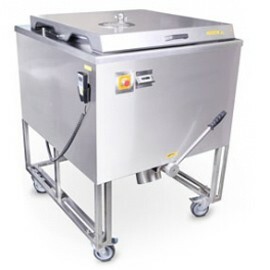 The mixers are economical, reliable and easy to use. These are the results of careful design, the choice and quality of manufacturing technology. mud mass discharge via a special hole with no scoop required. After the given time is up, the device is activated automatically, which is why it takes lesstime for the personnel to prepare the peat mass.